S. T. O'Connell and P. A. Thompson. 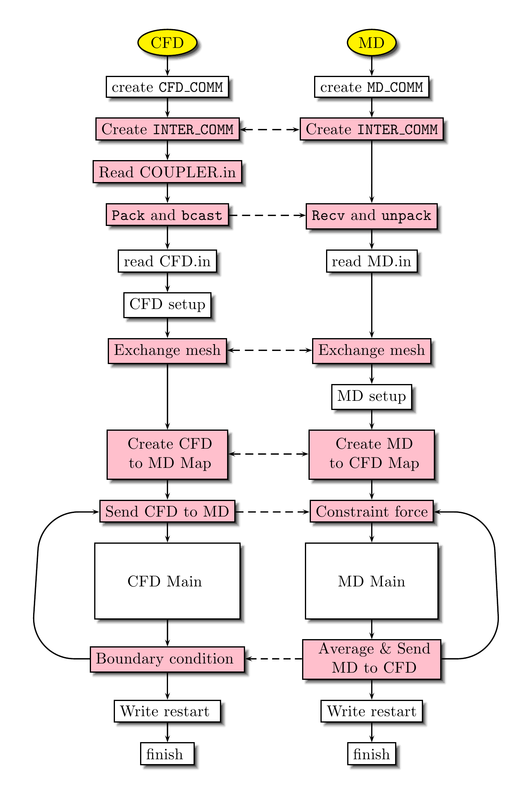 Molecular dynamics-continuum hybrid computations:A tool for studying complex fluid flow. Phys. Rev., E 52:R5792, 1995. R. Delgado-Buscalioni and P.V. Coveney. Continuum-particle hybrid coupling for mass, momentum, and energy transfers in unsteady fluid flow. Phys. Rev. E, 67:046704, 2003. X. B. Nie, S.Y. Chen, W. N. E, and M.O. Robbins. A continuum and molecular dynamics hybrid method for micro- and nano-fluid flow. J. of Fluid Mech., 500:55, 2004. T. Werder, J. H. Walther, and P. Koumoutsakos. Hybrid atomistic-continuum method for the simulation of dense fluid flows. J. of Comp. Phys., 205:373, 2005. N. G. Hadjiconstantinou. Hybrid atomistic-continuum formulations and the moving contact-line problem. J. Comp. Phys., 154:245, 1999. M. K. Borg, G. B. Macpherson, and J. M. Reese. Controllers for imposing continuum-to-molecular boundary conditions in arbitrary fluid flow geometries. Molec. Sims., 36:745, 2010. J. Li, D. Liao, and S. Yip. Coupling continuum to molecular-dynamics simulation: Reflecting particle method and the field estimator. Phys. Rev. E, 57:7259, 1997. W. Ren. Analytical and numerical study of coupled atomistic-continuum methods for fluids. J. of Comp. Phys., 227:1353, 2007. E. G. Flekk_y, G. Wagner, and J. Feder. Hybrid model for combined particle and continuum dynamics. Europhys. Lett., 52:271, 2000.